The deadline for this theme is midnight Pacific Time, Sunday 27 January 2019.
forty-nine degrees  who will pay for the wall? Thank you to so many for the kind words. With the tumult of my husband on furlough, I forgot that I had sent one in. I love the diversity of responses to this prompt – happy to be included. I miss her so much …..
What a lovely poem from someone who shall be missed. This gift from Rachel I shall keep close to my heart always. Thank you Rachel. Godspeed. Rest in peace, dear Rachel Sutcliffe! Leaving it here ,maybe will be commenting later. Prayers. Rachel was a ball of fire in her haiku, despite a desperately severe and chronic illness. I don’t think she ever allowed a gloomy day to effect her, and just like a haiku poet, found beauty in even the most mundane objects and situations. Her gentle craft, against all the odds, shines through. Such a simple haiku and it’s the judgement of where to place line breaks, rather than make it a one line haiku for instance. So so sorry to hear of Rachel’s passing away. Our haiku companion for many years. Such sad news. I’ll miss her presence and her words. This one captures what declining health in the later years does to the quality-of-life. This week’s selections have been a wonderful read. The yellow barrier and the surrounding scene inspired a surprising mix of responses and styles. I’ll mention four of my favourites…there are many more. Thank you Kathy for another great post. I feel honoured to have been included. Thank you so much for including mine, and the deeply poignant action of including Rachel Sutcliffe’s haiku, as she just died. It makes all of this so much more real, and that walls should only be raised to mostly shelter humans, and not to divide us. Thank you! Although I never lived in America, I have lived in an equally large country, and in farmland, when I lived in a Queenslander house. No walls, only tiny fences, and open spaces, and the coming and going of blue heelers, tractors, birds, cows, and horses, and the neighbour’s dog, was and is a fondly remembered treat. A wonderful one from Rachel, which I hope wasn’t her last for this THF feature, and that she might have sent a new one before she died. She really was expert at saying so much with so few words. Thank you Alan. I am saddened and shocked to hear of Rachel’s passing. I and I am certain many others will miss her writing. I’m always intrigued by narrators, as they are not always the author when we write a poem. 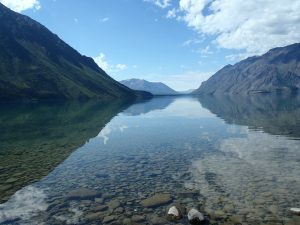 In haiku, as it’s both brief, barely six seconds of utterance, and commonly supposed, at times, that author and narrator are one, we zero in even more into the ‘voice of the haiku’. Now the author could be the narrator, and is merely assuming the park is empty as there is only that one person, them! That’s an intriguing stance and personal choice of presence to be made in itself. Do some of us remove ourselves from the equation when we are the only human in a specific area such as a park? What, why, who, which poets, and when, do they decide that the narrator, the poem’s talker, is other than the author themselves? In Japanese haikai verses the personal pronoun is often inferred (as it is in conversation and written correspondence) and accepted as a presence (but within the white space of talking and writing). We often know it’s not necessary to spell things out when we talk amongst friends, family, neighbours, or simply people local to our area. We ‘do shortcuts’ in our conversation: But we don’t step aside as a presence, except in creative writing? 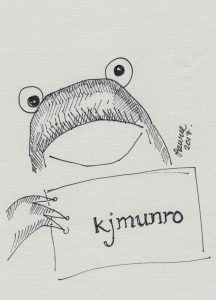 As haiku must be the shortest approach to creative writing, perhaps we will be too centre stage? Or is it an interesting perspective, to be the everyone narrator, or actually as if we are a surveillance camera, or even as if we are one of those rarely known and therefore anonymous surveillance camera operators? In effect, haiku can appear as if taken covertly, so why not from the perspective of the 24/7 electronic eye? Articles in grammar (a, an, the) are interesting as they do far more than act as a mere grammatical tool, they can nudge nuance. Is the park really empty, as this is not just any random dog, but ‘the’ dog. Is it the narrator’s dog, or the author’s dog? Or a dog that has become a stray, alone but for a doll dropped from a pram one day? Or is the author and narrator one and the same person, and merely letting the dog into the park very early in the morning, and the park appears empty as they are the living human soul, amongst the souls of other creative life, but not human? Aspects of the ‘everyone’ narrator, and even the no-one narrator, are intriguing devices whether meant deliberately or liberating, accident or design. A neat example of just four words, and yet better as a three-line haiku rather than as a monoku. We are given an expanse to be who or what we are, or were, or could be. I wonder how many fences we contain in ourselves even before we create external ones? Here, the fence is never an obstruction, as one of the world’s iconic creatures simply brushes the moon, almost as a personal statement. An everyone narrator voicing what surely most of us realise, that we only need just enough walls, as shelter, and the rest is a mistake. One’s self can be a noisy, demanding presence that covers up serenity. To release one’s self and become one with the haiku? Bliss. What I like about haiku is that it takes from the hokku and other haikai verses composed in the classic era up to the early 1890s and then appeared and evolved in the late 1890s just as the industrial revolutions gathered pace around the world, and continue to do. Yes, little pockets of space, of truth, sometimes quiet, sometimes pointing things out that are wrong. More and more people are clicking onto poetry be it online ordering, or on Twitter and other social media. When there is no truth or sanity, there is poetry, even when it bangs the drum a little. 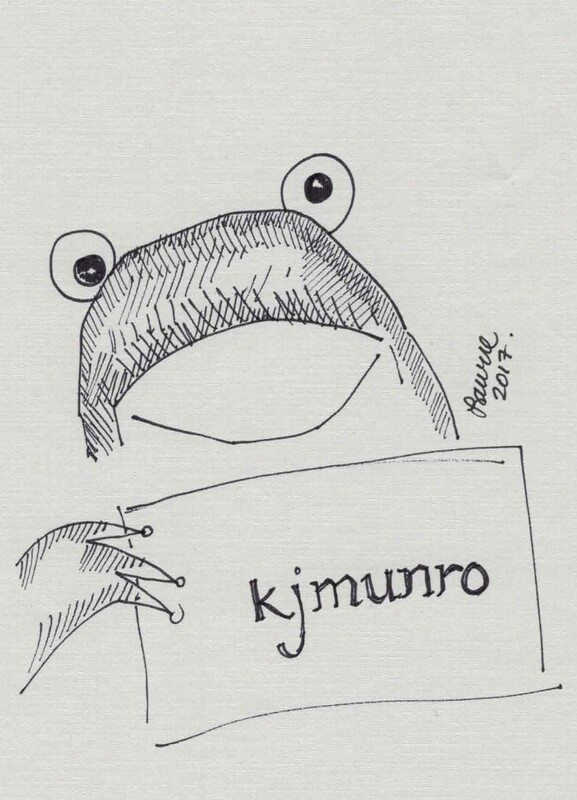 Anthology credits: The Humours of Haiku (Iron Press 2012); Faces and Place ed. Don Baird (The Little Buddha Press 2015); naad anunaad: an anthology of contemporary international haiku ed. Shloka Shankar, Sanjuktaa Asopa, Kala Ramesh, India, 2016  (Haiku Society of America Merit Book Awards, Best Anthology [tie] 2017); Earth in Sunrise: A Course for English-Language Haiku Study (Kumamoto University, Japan, textbook for teaching university-level English-language education) ed. Professor Richard Gilbert and David Ostman. Thank you Alan! I really questioned if this would have any meaning to anyone but me. I appreciate reading your comments on my own haiku and those of others. It is always a learning experience. It ticks all the boxes in my opinion. We have ‘rolling hills’ which is a great context setting and opening line, and expansive. Then we zero in and find a road, and then the powerful single word last line of ‘away’. Greetings! Indeed fine examples chosen by you. Reading over again and again. Thank you so much for your detailed appraisal of my haiku. There is so much to learn from all of you and I hope I prove to be a worthy learner. Alan,  Thanks for sharing your insights so freely. I can keep learning every week in this forum. I can see the thought and craft put into this poem, with an expansive, open, yet personal and immersive “rolling hills’ as I think of both beauty and freedom and something natural all together. As green belts are being created as we speak across desert-riven lands that were not so long ago green, only some of us can dream of ‘rolling hills’. The middle line is just two words, but ‘the road’ always carry meaning beyond its one syllable title for a route from A-B. We are always on ‘the road’ metaphorically and it’s our choice to walk, stroll, run, or even stagger from sign post to sign post to continue ‘our road’. The last line, just one word, feels intensely atmospheric to me, and adds a little mystery, a little Yūgen perhaps, where words are needed any further, or cannot capture. That last line could almost be an innovative pivot line/word, where in English, pivots tend to be placed only in the middle line, yet Margaret has found a way to be original in her exploration of what it is ‘to be’. I’m so glad. It’s an honor indeed to be included in this selection. I congratulate all the authors for their original interpretations of the feeling that we are behind the fence. 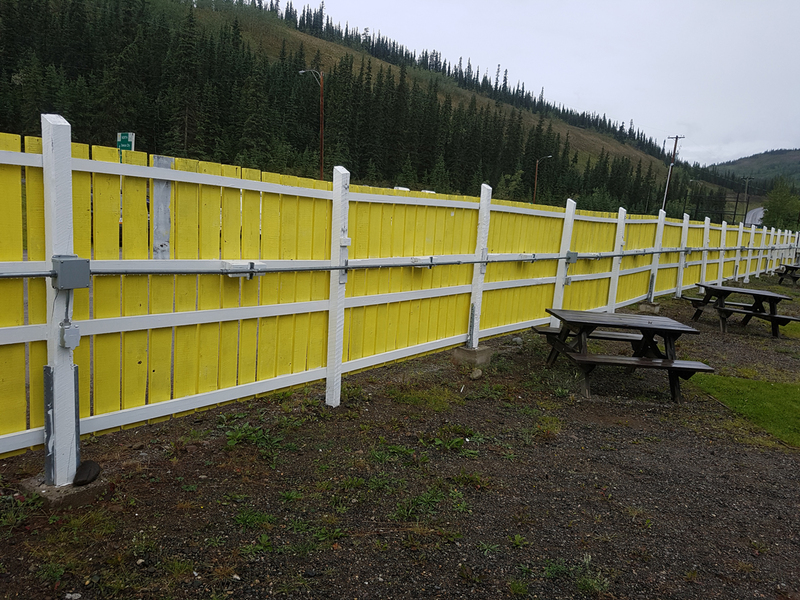 thanks everyone for the comments so far… what struck me this week was the number of poems about walls & borders – the political interpretations of this photo… which was taken at a campground on the North Klondike Highway between Whitehorse & Dawson City, just past the town of Carmacks. For those who might be interested, the tulip photo was taken in a friend’s yard in Kelowna, BC, & the snow was on my neighbour’s shed. The scene above is Kathleen Lake, near Haines Junction, Yukon Territory, Canada. Happy writing! Kathy, thank-you for telling us where the photos were taken. Thanks, Kathy, for your fence-full, fanciful selections. Christina, Thank you for your kind comment on my poem. I am glad it resonated with you. You’re welcome, arvinder. Truth is, among the many wonderful ones, it was one of my favorites — so much evoked, and so lyrically. Yes … we are part of the universe and our destiny is to overcome barriers. Thanks for sharing an understanding of our lives. I went blank on this prompt and didn’t enter, but thank goodness for those who did. So many good ones! the last line ” our minds’ borderlines ” by Adjei…a very poetic, even rhyming definition of a fence…which we draw ourselves. It begs the question, if we could put it up…we could take it down, at will. I looked forward to reading the poems for the fence prompt. I found it difficult and didn’t enter this time. But here are my favorites, all of which I found fresh and startling in some way, familiar in others, as in the poem about a border. I live on a border. I can feel all the potential emotions of a homecoming, with the last two lines. So much said in 4 words. Great monoku. So familiar to me living and crossing a border every day. I envy the birds freedom and their song is everyone’s song…make me think deeply about the divides among us when it comes to borders. This one just made me feel good! Yellow is a powerful uplifting color and I love the effect it had on this poet. This scene is worded in such a beautiful way. I can see it clearly. Ever since the fences and walls rose up in history it was merely a precursor to corporate dominion. What is wrong or scary or mean about wide open spaces and free movement? After all the biggest threat to a community can be its very own citizens, hence the all day and night need of a police presence. As the U.K. government has drastically reduced the street presence of ordinary police officers then violent crime has risen to alarming levels. We can never completely wall or fence someone out, or completely wall or fence ourselves in. Sometimes walls and fences are good, they hold a roof, for instance, that can bring shelter, or keep children or pets from running out onto a busy wall. But wouldn’t it be wonderful if we kept walls and fences, in general, to a minimum rather than to a maximum. Now that might be worth installing and repairing, more walls and fences for the forcibly homeless to call their own, when they want, on their terms, and no need for anyone else to fence themselves and others? Thanks, Alan, for the particles of you that show up both in your marvelous haiku (plural) and your awesome commentaries. It’s gotten so that when I see your name or get ready to click on one of your links I prepare for “pockets…of truth, sometimes quiet, sometimes pointing out things that are wrong,” though more often things that are spot on. Such benevolent, and yes, practical, guidance! Though I’ve saved your Sonic Boom interview til later, after long years I have, thanks to you, reread Frost’s MENDING WALL in its entirety. (Earlier I’d quoted the easily remembered contrary perspectives on a wall from its con-versation between two neighbors.). The whole of it is worth the re-read, especially in light of the ku and commentaries in Kathy’s column this week. So thanks again and again to you, Frost, Kathy, and all poets here and elsewhere who refuse to fence in their developing wisdom. With haiku being created just before the 20th Century, and taking a little from hokku, and a lot from the emerging industrialised world, it makes sense to include the darker aspects alongside the surviving beauty of the natural world (while it lasts). I feel that such everyday and dominant features such as walls and fences would naturally be picked up as symbolism, and so it’s been fascinating to see everyone’s take on that theme here. It’s been great! I guess when the Berlin Wall came down someone had to put up another one somewhere, and remind us that there are those who would divide us, and poets have a duty to resist. Well written comments this week. I’m enjoying all your takes on this image. A couple of haiku capture the fence-iness of fences particularly well in my mind. Many times I’ve run into old fences and walls in the woods and wondered, as Greer’s piece does, “keeping out or keeping in”? Old relics do keep their secrets, don’t they? Ingrid’s “no trespassing” gets right to the heart of how and why fences divide us. Thanks for sharing everyone. Have a good week. When I read this poem I thought of how the night hides physical flaws. Other than the obvious message, I thought about how trees branch out over neighbors’ fences and how that could be a problem, or be happily received. Also, I’ve seen many articles lately about plant consciousness. and what trees “know” – fascinating reading. A strong visual image and lots of fun! This one captures the imagination of childhood. Thanks for mentioning mine, Valentina, and to KJ for choosing it. Why is a person a stranger? Sometimes a person builds emotional or mental fences that leaves that person isolated. Sometimes these fences are built by others. This haiku captures both of these cases. This photo of a fence, coming as it does at a time of the Mexican border, France’s gilets jaunes and Brexit controversies, was likely to encourage poems where fences guard, become barriers, speak of secrecy, loneliness, privacy, seclusion and isolation, not just as physical obstructions, but psychological ones too . . .
endless fence . . .
and several others written in the same vein. Thank you Kathy for including one of mine. Thanks for your as-always insightful commentary, Ingrid. In my own first commentary it was your haiku, inadvertently omitted, that initially brought to mind both Robert Frost’s  words and (to me) the preposterous wall our current USA administration is trying to foist on us. You sum it up perfectly. Wonderful selection. The haiku that stands out for me are those that highlight the way people are divided, in sometimes sad, cruel and dangerous ways, e.g. which is an incisive take on the human condition of so many, myself (a gemini) included. Thank you, Martha. I have known life here in Northern Ireland during The Troubles and it was a dangerous place. With Brexit looming, I really don’t wish to go back to a situation where Northen Ireland and the Republic of Ireland are divided by a hard border. Thank-you for including one of mine this week. Along the lines of Rachel Sutcliffe’s and Valentina Ranaldi-Adams’s wonderful haiku here. This was the mood for me. Also quite taken with Julie Bloss Kelsey’s haiku as I too was observing that this is a utility fence and the empty picnic tables where federal park rangers, perhaps might have lunch if this were in a National Park or federal lands, for instance. Arvinder Kaur’s haiku very striking and love that take on the photo. 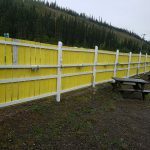 I had a very hard time responding to the yellow fence photo. It just wouldn’t speak to me. Thankfully that has not been the case for so many others! NOW I’m inspired! Charles Harmon paints a picture of our current social and political map… divisions everywhere. This captures the current politics beautifully! Well done! Totally agree, Julie nailed it. Those poor employees dealing with the mess while neither side gives. Thanks Kathy for including one of mine, too. yes,  ironically “good job”    Julie! Thank you Kathy for including my poem in your picks for this week, and the great picking job you have done with this HD.